This is no doubt the finest folding tripod style table that has ever been available to the magic fraternity. High-tech materials provide a stable platform that is free from wobbling or vibration. The non-skid 11" x 13" tray-top connects instantly and securely to the fully adjustable tripod. It is made from the finest black anodized aircraft-quality aluminum and composites. 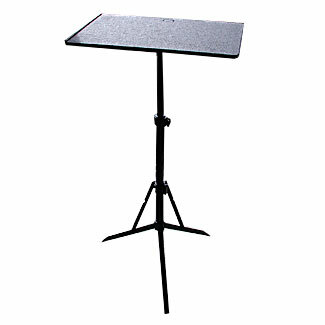 The table adjusts from 19" to 41" high and sets up in seconds. Folds to a mere 2" x 18-1/2", comes complete with a carrying bag, and weighs only 26 ounces. Not that we pay shipping for this item! Highly recommended.